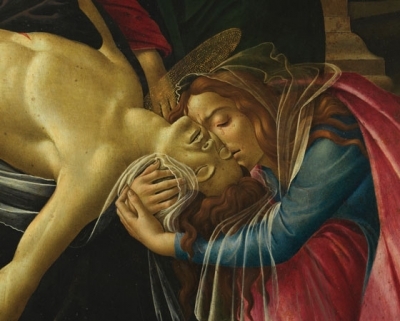 Mary Magdalene weeps over the body of Christ. Real quick I just thought I’d share with you an interesting new expression I learned today from one of my Spanish tutors, Silvia (she’s very good, check her out if you’re in the market! ), when I realized it would make a great 3rd installment in our Learn Spanish for Real series! What did Silvia say to me that inspired this post? The context of this was gas prices (petrol prices, for our British friends 😉 ). We were talking about the possibility of me renting a car while in Spain (probably not), which then led to comparing gas prices between the U.S. and Spain, which led to her saying “Cuando llegas a la gasolinera, vas a llorar como una Magdalena.” I had never heard this expression before so she explained. It’s very interesting. Why was Mary Magdalene chosen to express this? Because she’s known for crying. In the Bible it makes a point of stating that she cries when her brother dies, when Christ is crucified, and on several different occasions when she repents for her sins. Thanks to Significado y Origen de Expresiones Famosas for the background information.